First off, that cover is holy wow gorgeous blue! 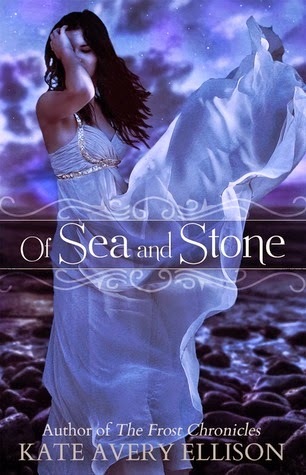 And second, I really enjoyed Of Sea and Stone! It was a wonderfully written, richly detailed story that had me gripped from the beginning. It may have been short, but it was a great start to the series! Even though this was a quick and short read, I could still connect with the main character, Aemi. She's a live-in servant to one of the richest families in the Village of the Rocks, but she wants more than that. She wants to be free, and she wants to live her own life. But she never would have chosen captivity. Aemi is tough and strong-willed, even though she's tossed back into the same world she's longed to leave. Being a servant living in an ancient underwater city, Aemi is out of her element, but that doesn't stop her from trying to learn its secrets so she can escape. I wish the secondary characters and her relationships with them had been a bit more developed, went a little deeper, but I think we'll see more connections being formed in the sequel. And I hope the sequel will also bring us a romance. I liked that this book didn't focus on it! I don't think I could even say it had a romance. I think this story was more about introducing us to the characters, the major players, and the relationships. And it had a strong plot. The world-building is wonderful and very detailed. It's a fascinating unique spin on Atlantis. I'm intrigued by where this is all heading. And even though the twist is sort of easy to guess, it didn't make it any less surprising by what was happening in the story and how it all played out. The plot was fast-paced and built up to a climatic ending that left me interested in reading the sequel for more. I really enjoyed Of Sea and Stone! I actually have a review copy of this one, so I should really get round to it! It sounds like a quick and enjoyable read, where the main character is easy to come to terms with. It's a shame that the secondary characters weren't deeper, but then no one is all perfect!